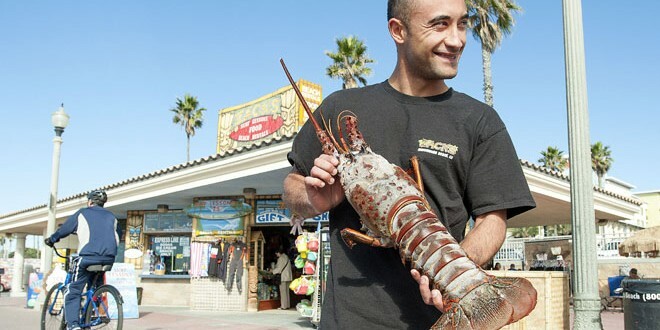 Joseph Ali says onlookers thought he was drunk when he dove into the nighttime waters around a Southern California pier, but he returned to shore with a monster of a lobster and the catch of a lifetime. Ali said he was closing his father’s business, Zack’s Pier Plaza in Huntington Beach, on Monday when he saw the ocean was calm and decided to dive for dinner. Ali was swimming 15 feet below the calm surface and chasing a smaller lobster when the larger critter actually grabbed onto him which, frankly, would have led me to lose my appetite (if not my lunch). 7. Your claw cracker is a pair of industrial-strength bolt cutters; your lobster pick is replaced with a pitchfork. 6. The server tells you there will be a short wait while water is heated to boiling in the lap pool at the Y. 5. Drawn butter is delivered as fast as they can churn it. 4. Your lobster bib? A sail from Oracle, 2013 America’s Cup winner. 3. The menu notes that market price may be affected due to lobster’s celebrity status after appearing in Japanese monster film. 2. Doggie bag could actually hold a large St. Bernard. 1. Its hollowed-out tail will be rented out as a $4,000-per-week shelter during SXSW 2014.